A couple of days ago, I received a package in the mail from a friend of mine. Apart from the occasional text message here and there, we’re terrible at keeping in contact (who has time for phone calls and emails these days??! ), but every once in a while, one of us will surprise the other with a little something in the mail. Sometimes it’s a card, other times it’s a piece of jewelry, and last week it was a beautiful plaid blanket scarf. HOW DO I WEAR THIS?! None of my mom friends sport this look at school drop-off and pick-up, but since I’m not one who likes to blend in with the crowds (I much prefer to stand out! ), I decided to pour myself a glass of white and dedicate an entire evening to teaching myself how to wear a blanket scarf. I bought a GREAT book on Amazon called 50 Ways to Wear a Scarf a couple of years ago, and fell completely in love with scarves while trying all of the different styles out, and I’m slowly learning that the blanket scarf is one of the most versatile accessories you can own. It can be worn so many different ways – as a throat warmer, mini cape, off-the-shoulder wrap, belted poncho, and body wrap to name a few – and after putting it to the test a couple of times this week, I am officially in love. 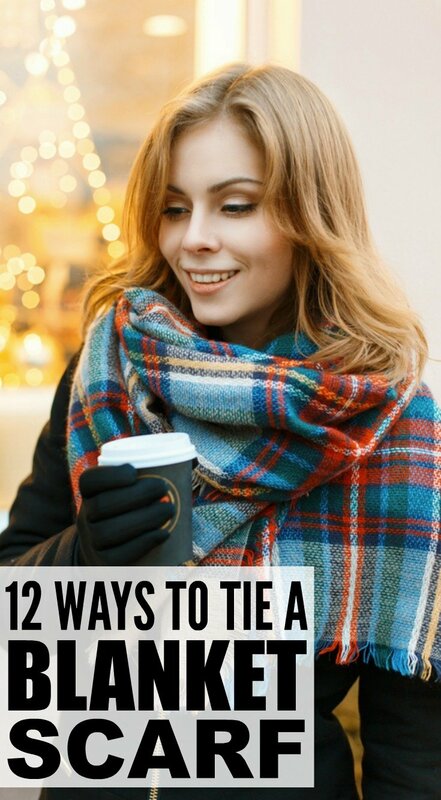 I watched dozens of different YouTube tutorials before I fully mastered each look, and of all the different clips I watched, this collection of 12 Ways to Wear a Blanket Scarf by Cosmopolitan.com was by far the most detailed and helpful. My only warning to you is this: after watching this clip, you’ll probably want to run out and buy yourself a blanket scarf in every color, so tread carefully, my friends! Don’t forget to CLICK HERE to subscribe to Cosmopolitan.com, where you’ll find the latest in fashion, beauty, health, and self-improvement! If this tutorial inspired you to learn how to wear a blanket scarf, please share it on Pinterest! And if you’re looking for more fashion-related tips and tricks, please follow our Fashion board where we share the latest trends!